The HP Photosmart D5460 Printer is one of HP's newest printers on their line-up. The HP Photosmart D5460 has a compact design, perfect for everyday home printing. It utilizes HP's five-ink printing system so you can print out high quality photos with vivid colors as well as professional looking documents. The HP Photosmart D5460 has a 1.5 inch display so you can get access to your printer without having to boot up your PC. A multiple memory card slots also ensures that you can be able to print your photos stored on a variety of media whether the photos are taken through a cell phone or digital camera. The HP Photosmart D5460 can also print designs, text and photos direct onto CDs and DVDs and also has the ability to print multiple sized photos through an automated photo tray that can automatically select the size and type of paper so users can switch effortlessly between photo and document printing. HP's newest printers now utilizes individual ink cartridges, something which Epson printers have been long doing. This allows consumers to truly save on ink as they only replace the colors that really need replacing. The HP Photosmart D5460 can also handle a variety of media types and sizes so users can print business cards or Greeting Cards though probably not as professional looking as the greeting card pictured below from cardsdirect. Besides, even with HP's supposed high capacity ink cartridges, I bet the cost per greeting card you make on this printer is nowhere near $1.25. Print speeds of the HP Photosmart D5460 is around 33 ppm for black and 31 ppm for colored documents. 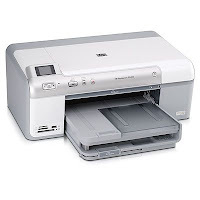 The HP D5460 is a low cost printer that is perfect for any home. At a suggested retail price of $99, you can't go wrong with the HP Photosmart D5460.